A paint job on your boat serves more than just a decorative purpose. We all love the look of a freshly painted boat as the sun hits it in just the right spot. Just as important as the look it provides, a fresh paint job on your boat also provides protection. If the paint on your boat has chipped and broken down, that can lead to other boat damages such as rust and corrosion. What better time to get your boat painted than during the offseason! If you live in the Minneapolis or St. Paul, MN area, team up with Anchor Marine Repair today for all of your boat painting needs. 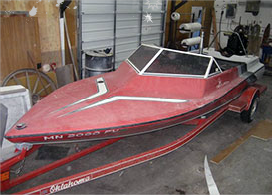 Just because your boat looks outdated and in poor shape doesn’t mean you have to get a new boat. As long as the engine and other mechanical parts of the boat are properly functioning, you can get many more years out of your boat with a simple paint job. In fact, our painting specialists at Anchor Marine Repair can provide the facelift that you’ve been dreaming of. 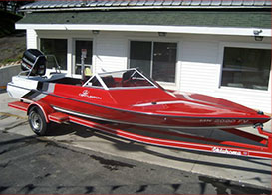 Whether you are looking for a classic paint job, or want to add some flare to your boat, our team has you covered. This fresh paint job will not only bring that smile that’s been missing when you take a look at your boat, but it also offers a protective coating against debris and weather. Take advantage of an affordable fresh new look with a paint job from Anchor Marine Repair. At Anchor Marine Repair, we pride ourselves on being a one stop shop for all of your boat needs. If your boat needs any repairs before a paint job, we can get it all done in one fell swoop! All that you need to do is give our staff a call, and we’ll handle the rest. Our goal is to make it as easy as possible for you as a boat owner to get that new look you’ve been wishing for. In fact, we offer free pickup and delivery services within a 250 mile radius of the Minneapolis and St. Paul, MN area. If you are ashamed by the look of your boat, but you know that it still is in good working condition, team up with Anchor Marine Repair today and let our experienced staff apply a fresh paint job to your boat. After this facelift, you’ll feel like you’re in a brand new boat for just a fraction of the cost! Give us a call today at (763) 972-3540 to set up a free estimate today.